Much like Weight Watchers doesn’t go out of its way to mention that its new superstar spokesperson Oprah Winfrey also happens to own a large chunk of the company, the weight loss program isn’t exactly stepping over itself to disclose that a new study touting Weight Watchers’ was paid for by Weight Watchers. This seemed to be great news — an independent study that singled out Weight Watchers as a possible treatment for prediabetes? Given the current obesity problem and that the Baby Boomer generation is reaching retirement age, it would appear to put Weight Watchers in a great position financially. And the stock market reacted appropriately, with the share price jumping by around 50% in a single day as numerous media outlets picked up the story. Some folks, like the NY Post’s Lisa Fickensher, did notice the source of the funding, and spoke to researchers who say that industry-funded studies don’t always result in unbiased research. “We found that if a food company sponsored a research study, the outcomes were four to eight times more likely to be more favorable to that company’s interests than if the study was independently funded,” David Ludwig of Harvard Medical School and the New Balance Foundation Obesity Prevention Center, tells the Post. Additionally, while the press release seems to paint a picture that Weight Watchers was the best weight loss program for treating prediabetes, what the study actually compared was Weight Watchers and one very specific plan: The “Your GAME PLAN to Prevent Type 2 Diabetes” from the National Diabetes Education Program. Regardless of whether or not the company-funded study qualifies as sound research, it did — at least temporarily — help the company’s stock price. Before the study hit the news last Thursday morning, the stock was trading as low as $11.15/share, then jumped up to $15.22 by Friday afternoon. Things have cooled slightly, with the share price at $14.22. That’s still only about half of what the stock was worth only a few months ago. After bottoming out last summer at around $4/share, the company was briefly buoyed by Oprah’s investment. The media mogul — who, in 1988, famously lost 67 pounds on the Optifast liquid diet (and made the brand an overnight sensation) only to later reveal that her “metabolism was shot” because of the diet –acquired a 10% stake in the company in mid-October, sending the share price soaring to more than $26 by Thanksgiving 2015. But by Christmas, it had already sunk back to $18. 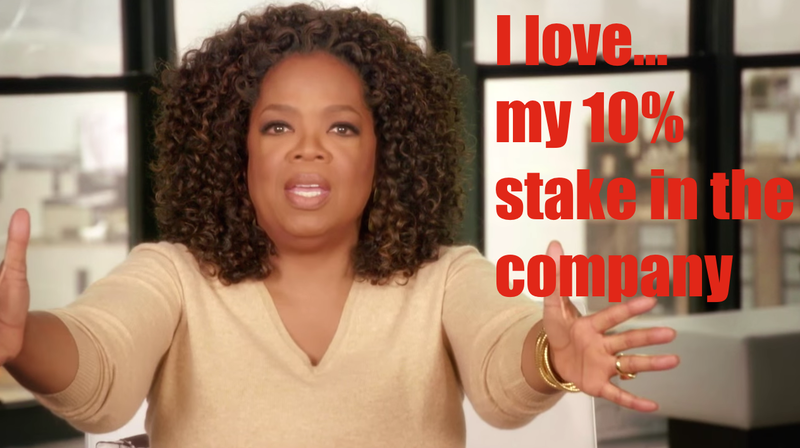 By late January, with the stock price all the way down to $11.12, Oprah once again intervened with the introduction of those commercials where she rambles effusively about her love for bread, resulting in more than a little bit of ribbing from the Internet.